The little girl has lost her way in the maze and the gates are about to be locked up for the day. Can your child help her reach her mommy by finding a way out in time? 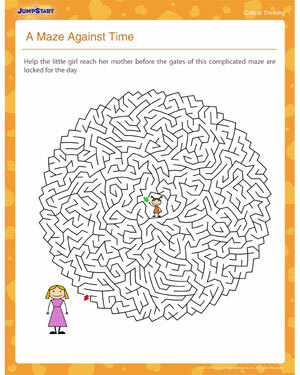 Tracing a route out of this complicated Mother’s Day maze will help develop your 2nd grader’s critical thinking skills and hone his motor coordination skills. Is he up to the challenge?